Neal is a recently retired professional football player of 11 years, playing for the Saskatchewan Roughriders. He was fortunate enough to win to Grey Cup Championships, which is like winning two Super Bowls in Canada. But.. football is not his only passion. He grew to love fishing at a young age thanks to his father and grandfather. He is very lucky to have many lakes to fish close to home, most notably Last Mountain Lake in Saskatchewan, where a world record live release walleye was caught just a few years ago. Because his family could not afford a boat, ice fishing was his go to style of fishing, and to this day it is still his favorite type of fishing. Nothing beats ice fishing with family and friends, especially when the bite is hot! In 2013 Neal had the opportunity to fish with Tom Gruenwald, thanks to Fishing Saskatchewan hosts Steve Bunka, Andrew Smith and Production Manager Terry Allington. One of his childhood dreams was to be on a fishing show and to Neal, being on this fishing trip with Tom and company was a dream come true! Now, Neal is a host for Fishing Saskatchewan, reliving his dream over and over again! Recently, in December of 2014 along with Fishing Saskatchewan, Neal the opportunity to host Tom again at one of the top walleye fishing destinations in the world… Tobin Lake Saskatchewan. It was a VERY successful trip and he made memories to last a life time, helping to make one of the best Ice Fishing episodes in ice fishing history…he says you have to see it for yourself, but only on TGO. 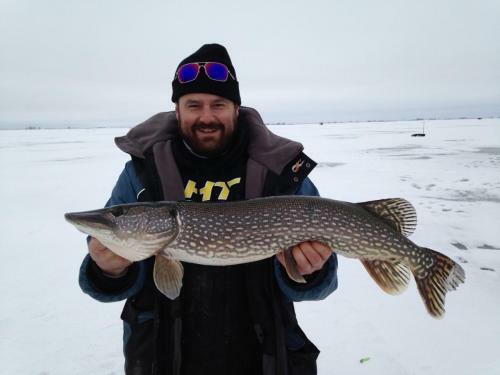 Neal plans to continue co-hosting with Fishing Saskatchewan, and is looking forward to the next opportunity to catch monster fish on the frozen battle field!